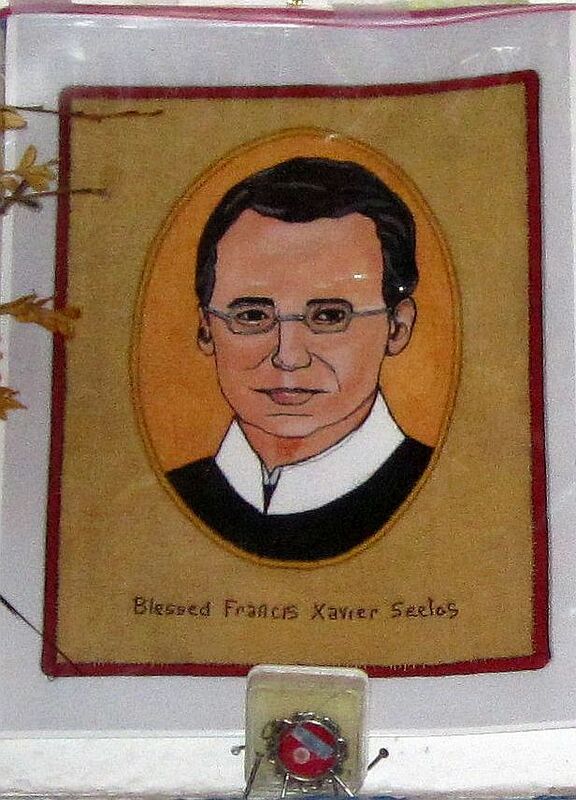 Due to medical reasons,the "PILGRIMAGE TO BLESSED FRANCIS XAVIER SEELOS HOMELAND" May 1-11 2019 has been postponed until October 2019. 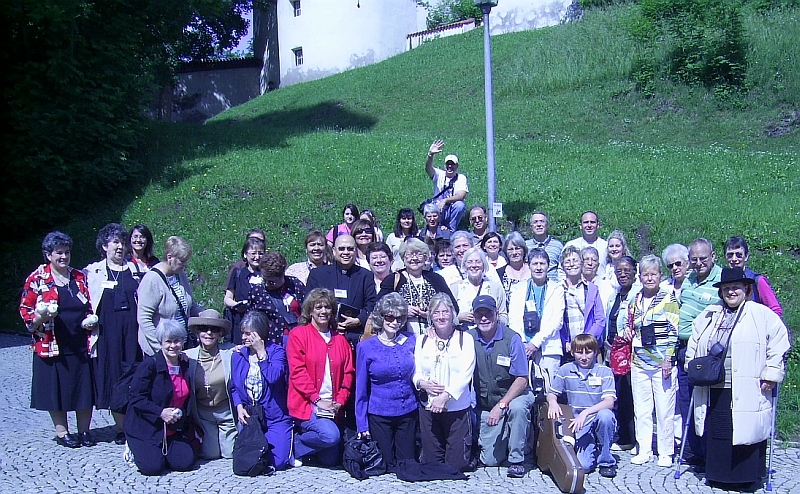 Mary Perricone,who is arranging the Pilgrimage informed "Seelos in Füssen" exclusively 14th February 2019.She told us "The new dates will be October 9 through the 19, 2019. It will be the same itinerary, and we will be there on the same days of the week. We hope to be able to attend the Mass at St. Mang's on Sunday October 13, and the next day, Monday, at 9:30am, have Father Grile celebrate a private mass for our group, as previously planned. "Father Grile,National Director of the Seelos Center in New Orleans will be leading the pilgrimage. Historian Dr. Robert Worden's forthcoming book, "Soldiers of the Cross: Blessed Francis Xavier Seelos and the Catholic Community in Annapolis During the Civil War" goes into great detail about the impact of the war on Annapolis and specifically on the priests, brothers, seminarians, and parishioners of St. Mary's Church. He will present "untold stories" about some heretofore obscure members of the Catholic community, including both free and enslaved African Americans, European immigrants, and long-time residents. Dr. Worden is the long-time archivist and historian of St. Mary's Parish. at the rear of the Basilica on the left hand side. 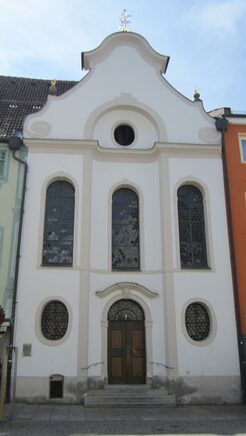 Pilgrims will be shown the Spitalgasse and look at the plaque on the house where he was born. 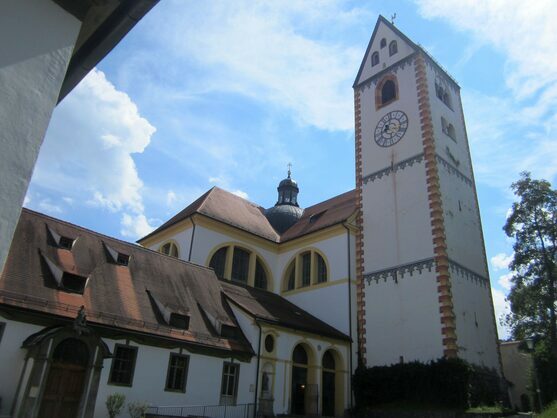 before school as well as the Frau am Berg Kirche where his sisters often prayed for him. The Day in Füssen is part of a bigger pilgrimage which will visit Munich,Altötting,Oberammergau,Füssen,Innsbruck,Salzburg,Melk,Vienna,Prague. Archbishop Gregory Almond of New Orleans Archdiocese, will celebrate Mass in honour of the 200th birthday of Blessed Francis Xavier Seelos, at 1300hrs on Sunday 13th January 2019 in St Mary's Assumption Church.He will also be the homolist.All are welcome to also partake the Sacrament of Reconciliation & the annointing of the sick. Breaking News Update-14th February 2019-This pilgrimage is postponed due to medical reasons until October 9 through the 19, 2019. As we exclusively announced on this website on 24th April this year,Father Harry Grile C.Ss.R.,Executive Director of the National Seelos Center in New Orleans will be leading a Pilgrimage entitled "PILGRIMAGE TO BLESSED FRANCIS XAVIER SEELOS HOMELAND" May 1-11 2019.Those living in the United States of America and wanting to go can find full information on the page below. 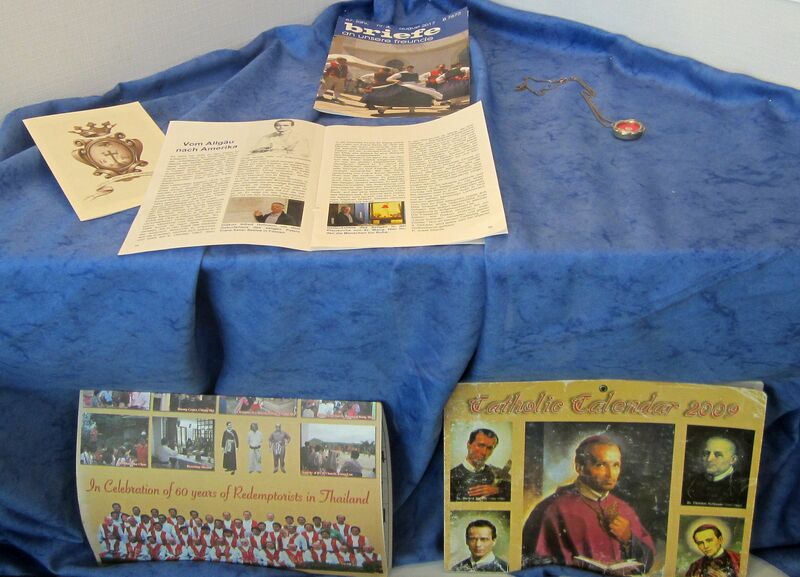 The trip will visit Munich,Augsburg & Füssen before travelling to Austria and visiting Salzburg & Vienna.As the pilgrimage is led by a Redemptorist priest,it is hardly surprising that whilst in Vienna they will visit the shrine of St Clement Hofbauer who like Father Seelos,was also a Redemptorist priest. The National Seelos Center in New orleans has released the following statement from Maureen K. Vicknair,Administrative Assistant. Additional volunteers are needed in many areas. The blog contains a simple form that can be used by anyone wishing to volunteer. It can be filled out on-line and sent directly to the administration office by a click of a button. Please encourage anyone you know to visit the blog and to think about volunteering at the Seelos Welcome Center. We would like to post a photo and a short bio of all of our volunteers so that our volunteer family members will recognize each other. The intention for the blog is to show people the wide variety of the many great people who volunteer from all walks of life, all ages, and all races. 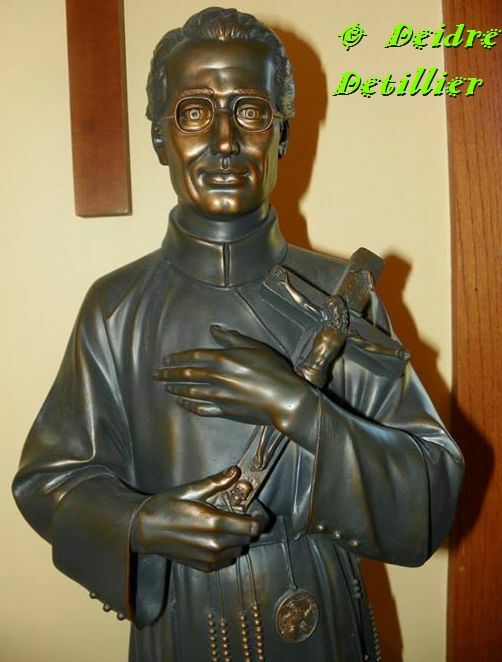 The blog also has a feature for anyone to post a positive testimonial about Blessed Seelos and the Seelos Welcome Center and Shrine. We encourage all of the friends of Blessed Seelos to use this feature and help us recruit additional volunteers. Welcome to the new Seelos in Füssen Site. Unfortunatly due to the new EU DATA REGULATIONS we had to loose a lot of information from the old website. We do not collect any information about you on this site although we do know we have had a visitor! 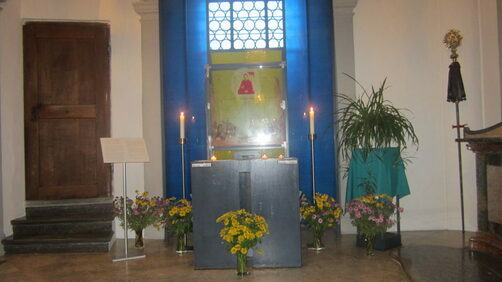 We also had to close down the prayer request facility and guestbooks. 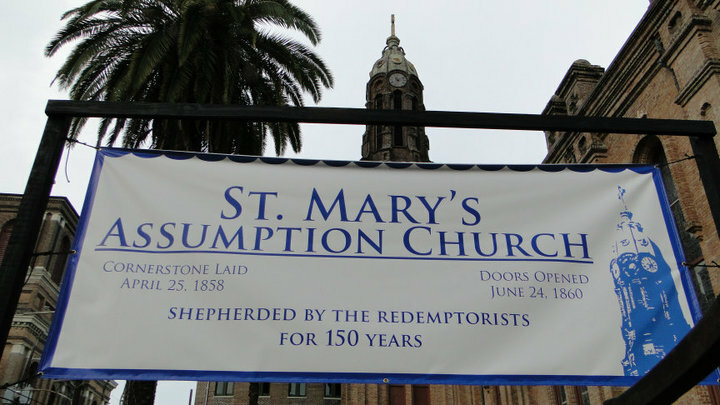 report very accurately as they claimed the archbishop of mobile had attended.he will in fact be at the 0800hrs mass on 29th july to install father jim cink as the parish priest. Sunday, January 13, 2019 at 1300hrs. 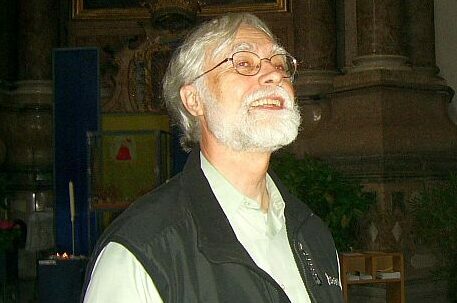 Father Harry Grile,Executive Director of the National Seelos Shrine in New Orleans is arranging a Pilgrimage to Füssen in the first week of May 2019.He has chosen Mary Perricone of Travel Central based in Metairie, LouisianaUSA to put the trip together and lead it.They are hoping to bring a group of about 35 pilgrims to visit the city where Blessed Seelos was born on 11th January 1819.There visit next year will of course fall in the 200th Anniversary year of this great "son of Füssen".The itinary is still being planned and will include visiting the sites associated with Blessed Seelos here in Füssen as well as visiting surrounding towns and villages. Father Harry is particulaly looking forward to celebrating the Holy Mass in St Mang Basilica where Seelos was baptised the day of his birth. Blessed Francis Xavier Seelos is one of 300 New Orleaners who the Times Picayune have chosen to feature in their "300 for 300" series.New Orleans celebrates its tri-centenary this year,hence the 300 for 300 series.The New Orleans paper has chosen 300 personalities who it claims "made New Orleans New Orleans. 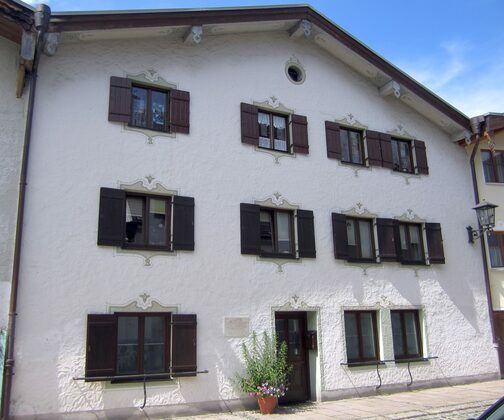 The Parish Priest of Füssen,Hopfen & Weißensee,Father Frank Deuring has announced that Seelos House in Füssen will be sold.Seelos House is used by the parish of St.Mang as a meeting place.However due to changes which have become neccesary within the 4 Parishes of the Fussen group,it has been felt that Seelos House must go.Other changes will see the demolition of Acht Seligkeiten,the 600 seater church in west Füssen,the sale of the Presbytary and church office in the city centre & the Parish Priest moving also to west Füssen.West Füssen would have a new Catholic Kindergarten built as well as a small church,church office and a place for the Parish Priest to live.The curate will live close to the city centre.It is planned that the elderly & tourists will continue to worship at St Mang Basilica & the Franciscan Church of St Stephan whilst west Füssen would become the place of worship for young people and their families.It is hoped that all will be completed by 2022. Seelos House was named after Blessed Francis Xavier Seelos who was born here in Füssen.The mural was painted by Otto Kobel of Seeg.He is famous for his work with the "Waal Passion Play" & in 1987 he produced "The mystery of the death of St Mang" a play written by Arthur Maximilian Miller here in Füssen.Otto Kobel is also responsible for many religious works of art which can be found in parishes throughout the area.The Mural in Füssen is unfortunately not completed.It shows servers with Blessed Francis Xavier Seelos because the Altar servers from St Mang Basilica meet in the building once a week to play games and get to know each other better.As he worked in the southern States a coloured person was included in the mural to join other representatives of the immigrants and locals who were in need of spiritual care. 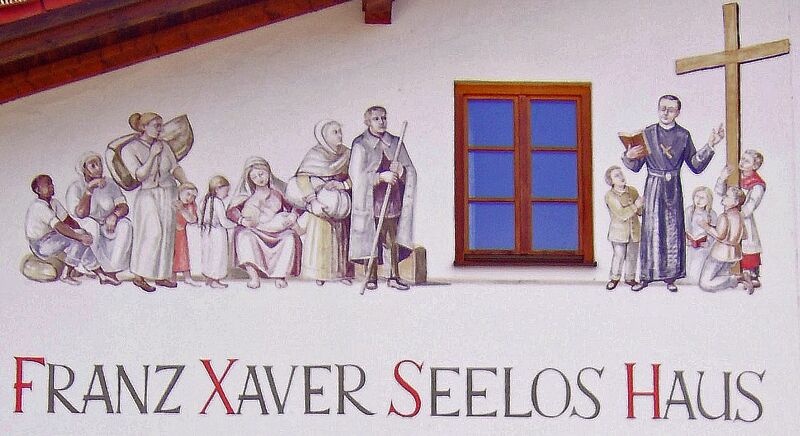 The completed mural should have shown Seelos when he lived in Füssen and also when he emigrated from Germany to the United States traveling via New York according to Former Parish Priest Karlheinz Knebell(R.I.P.) who commisioned the artist. Archbishop-emeritus Alfred Hughes gave a lecture on the role of Catholics in the three-century history of New Orleans at 1830hrs Tuesday, Jan. 16, in Schulte Hall at Notre Dame Seminary, 2901 S. Carrollton Ave., New Orleans. His lecture, "Ordinary People, Extraordinary Gifts," focused on the lives of St. Frances Cabrini, St. Katharine Drexel, Blessed Francis Xavier Seelos, Venerable Henriette Delille and Margaret Haughery. 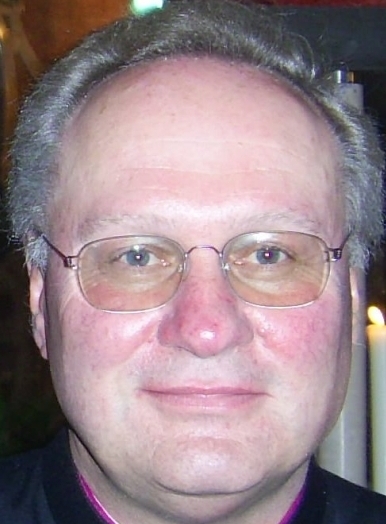 Bishop's Vicar Karlheinz Knebel(R.I.P. 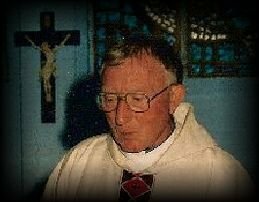 ),former Parish Priest of Fussen died on the 4th November 2017.He was a great promoter of Blessed Seelos and wrote a booklet about the Fussen born Blessed.He was also in St Peter's Square Rome when Saint Pope John-Paul 2 beatified Seelos. There will be individual anointings with oil from the National Blessed Seelos Shrine and the opportunity to venerate the Seelos relic. For more info, call parish office 228-435-0007. 0830hrs on the Feast of Blessed Francis Xavier Seelos,Holy Mass was celebrated in the Church of Acht Seligkeiten(8 Beatitudes), in Füssen west.The curate,Father Christian Wolf celebrated Mass on this joyful occasion.The congregation joined in full voice in the hymns,musical accompaniment on the guitar was provided by Sabine T.Serving the Holy Mass was brother Franziskus of the Premonstratensians from Roggenburg Monastory,who is helping out in the 4 Parishes. 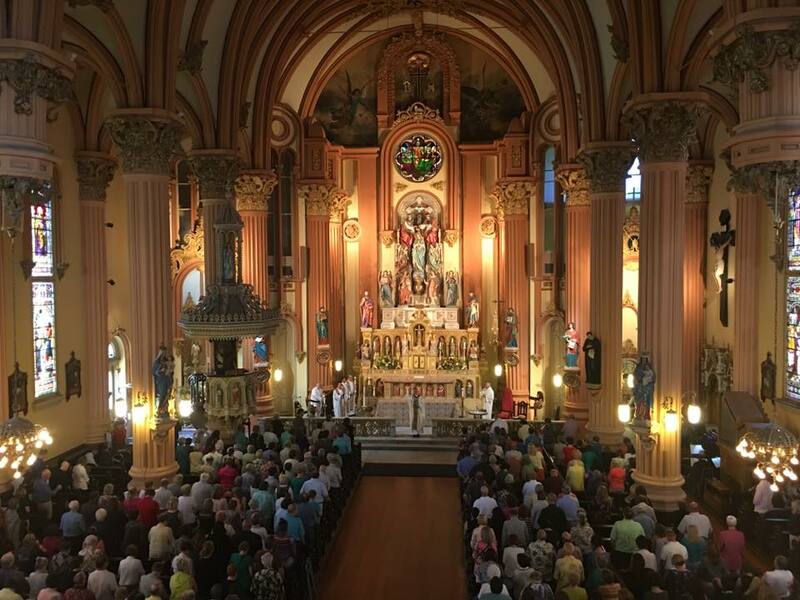 Holy Mass was celebrated at 1900hrs in the Parish,which bears the name of Blessed Francis Xavier Seelos and is located in New Orleans.The Parish has a thriving Spanish speaking community.Starting on the 6th October at 1900hrs the Parish will have the 40 hrs devotion. 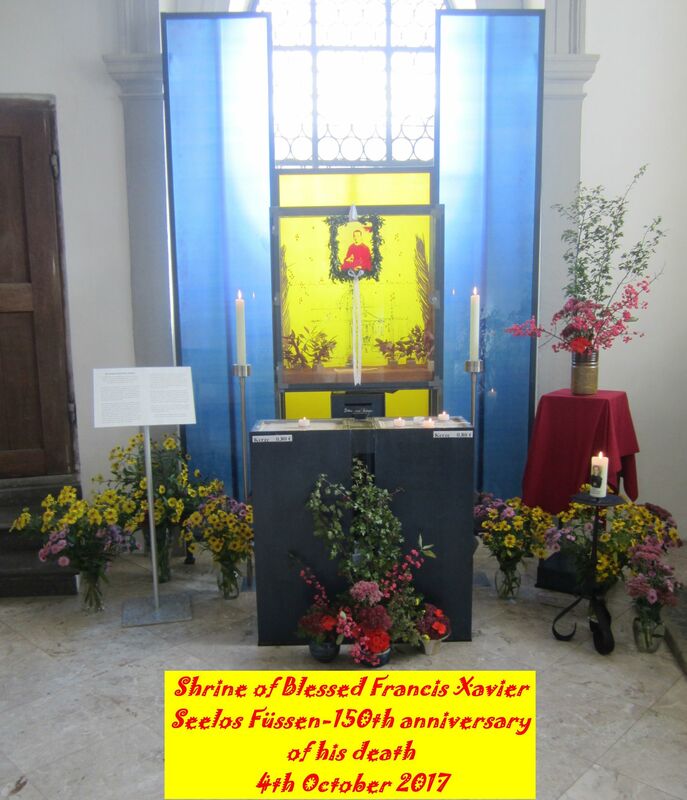 Holy Mass was celebrated by Parish Priest,Father Frank Deuring for the 150th Anniversary of the death of Blessed Francis Xavier Seelos.The congregation started off at the Seelos Shrine located on the left hand side at the back of St Mang Basilica. 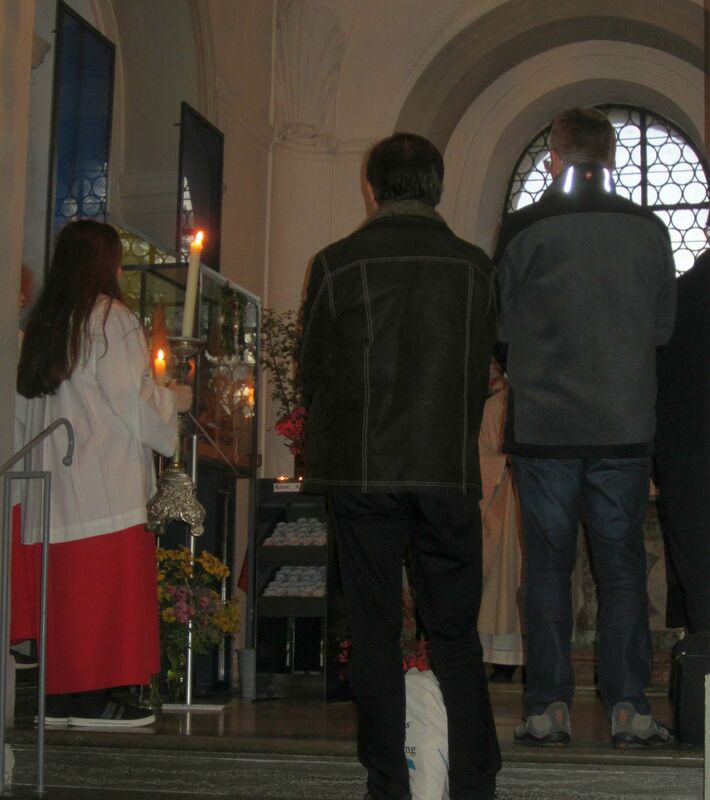 (Photo above).They then processed via the main isle to the Monk's Choir,located behind the main altar where the Holy Mass was celebrated.Many came to give thanks for the life of Blessed Seelos and pray for more priests,especially from the Parish.Sabine T. played the guitar at the Seelos Shrine & the organ in the Monk's Choir.Michaela & Claudia Rosenthal-English served the Mass and the 1st reading and bidding prayers were read by Sabine M.
As well as the Shrine being decorated there is a display in the porch which includes a 1st class relic of Blessed Seelos.Mass will be celebrated at 1900hrs in St Mang Basilica in honour of Blessed Seelos. 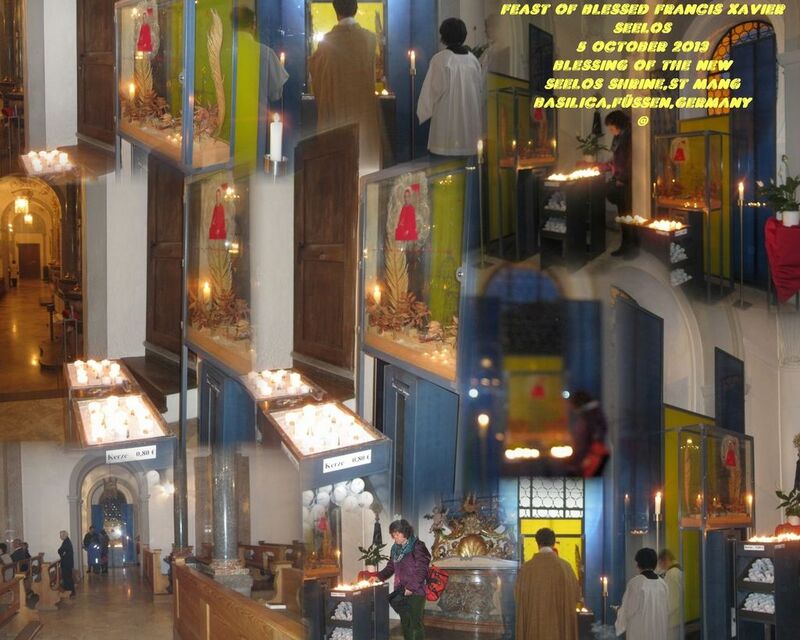 On his official Feast Day-5th October,Mass will be celebrated at 0830hrs in the Church of "Acht Seligkeiten" Birkstr. 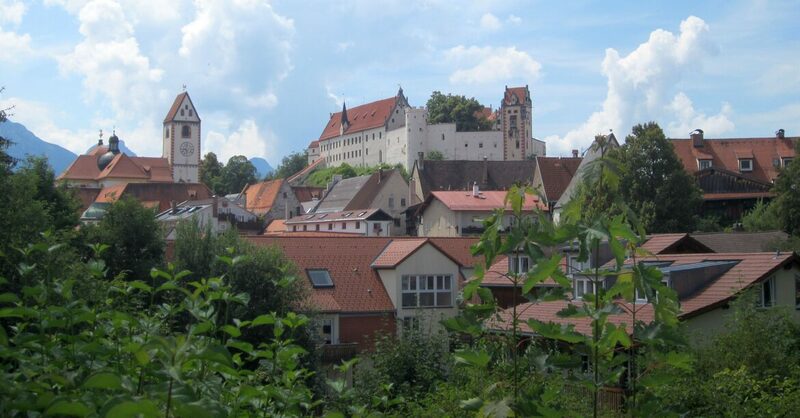 20, west Füssen. Miriam Rosenthal-English,who translated the Seelos Novenna of Father Byron Miller C.Ss.R. from English into German,offers prayers of thanksgiving for the help Blessed Seelos has given her. Monsignor Arthur W. Bastress was just weeks away from the 66th anniversary of becoming a priest when he had to retire at the age of 90 due to ill-health.He retired from active ministry at the National Shrine of St. Alphonsus Liguori in Baltimore in June 2017.Monsignor was a great lover of Blessed Seelos and celebrated Holy Mass in St Mang Basilica,where Seelos was born,on 12th May 2011. 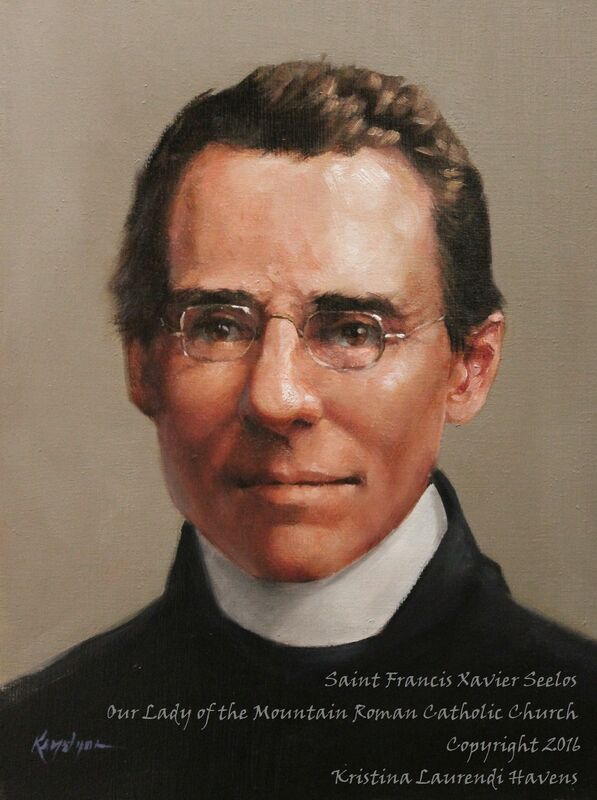 Blessed Francis Xavier Seelos served in Pittsburgh and worked with St. John Neumann in the 1840s at St. Philomena Church in Pittsburgh’s Strip District, which is where the Redemptorist order was centered. Priests from the Redemptorist order served the fledgling St. Alphonsus parish. US COLLEGE BUILDING NEW "SEELOS CHAPEL"
The president of Donnelly College in Kansas City, Kansas,Monsignor Stuart Swetland was recently interviewed by the National Catholic Register.During the interview he said "We are building a new chapel named for Blessed Francis Xavier Seelos, who is not that well known — he was dedicated to helping the poor — learning about him is educational"
Details are finally coming in about how the St Mang Parish in Füssen,will commemorate the 150th Anniversary of the death of Blessed Francis Xavier Seelos,who was born in the parish,11th January 1819. 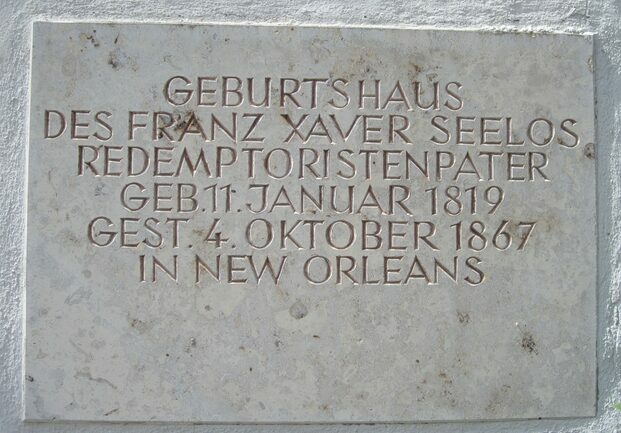 The Deacon is a mine of information about the history and customs of old Füssen and has a great love of Blessed Seelos.He has visited the National Seelos Shrine in New Orleans,as well as the Church of St Mary Assumption where Seelos served in his last post,before dying of yellow fever on 4th October 1867. 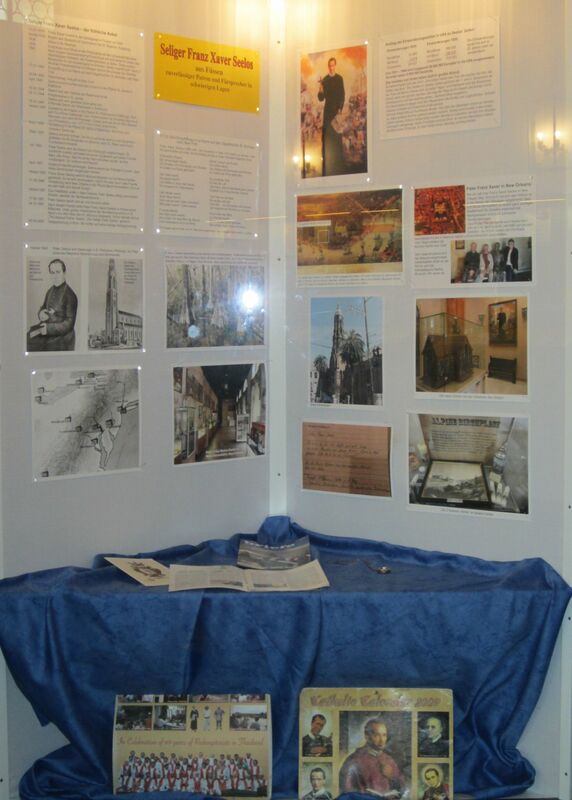 The Parish also have a glass display case in the porch which is changed regulaly to show Parish Pilgrimages,activities and also promote The Rosary,St Mang and other Catholic issues.During the month of October it will feature Blessed Francis Xavier Seelos in honour of the 150th Anniversary of his death.We have been informed by one of the priests who works in the Parish,that a special Mass will also be celebrated,this will be on 4th October at 1900hrs in St Mang Basilica. When I first came across the name "Reredos",I had to resort to my dictionary.What was this refering too and how did Blessed Francis Xavier Seelos fit into it? 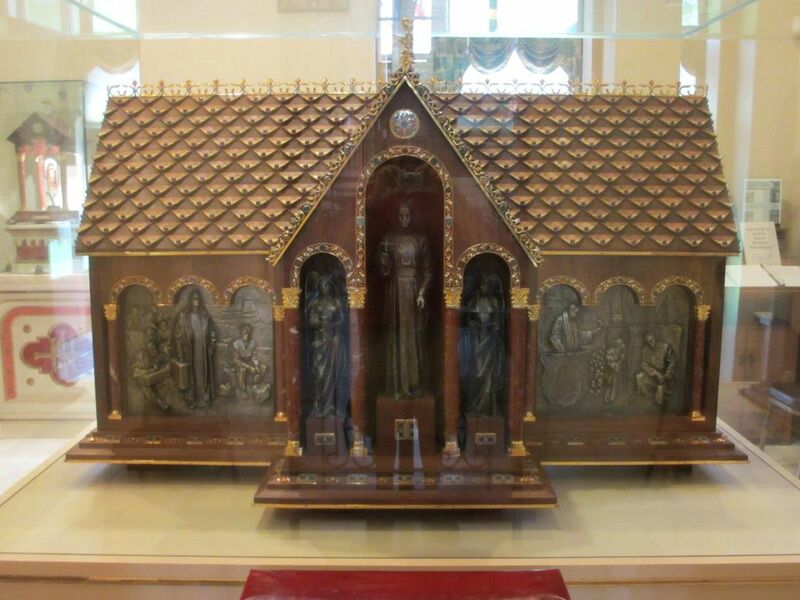 According to the dictionary,a Reredos is a large Altarpiece,screen or decoration placed behind the Altar in a church.It often includes religious images.It can be made of various materials,the one we are interested in is made of wood with niches for the paintings. I came across a photo of Blessed Seelos I had not seen before the other day whilst searching the web.I traced it back to the Catholic Church of Our Lady of the Mountains,Jasper,Geogia,U.S.A. 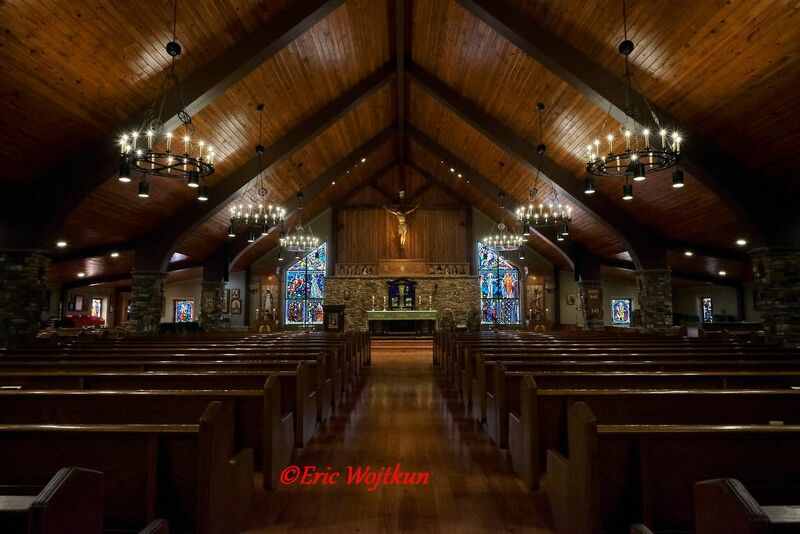 Our Lady of the Mountains is a small thriving Parish located in the North Georgia Mountains.The Parish is run by Father Charles Byrd and has over 550 families within its boundaries. 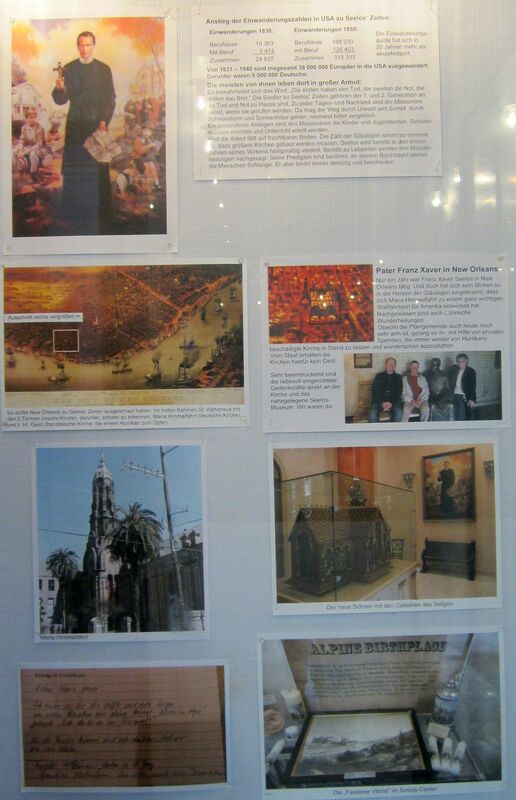 Parish Priest,Father Charles Byrd told me more about the parish and Blessed Seelos. 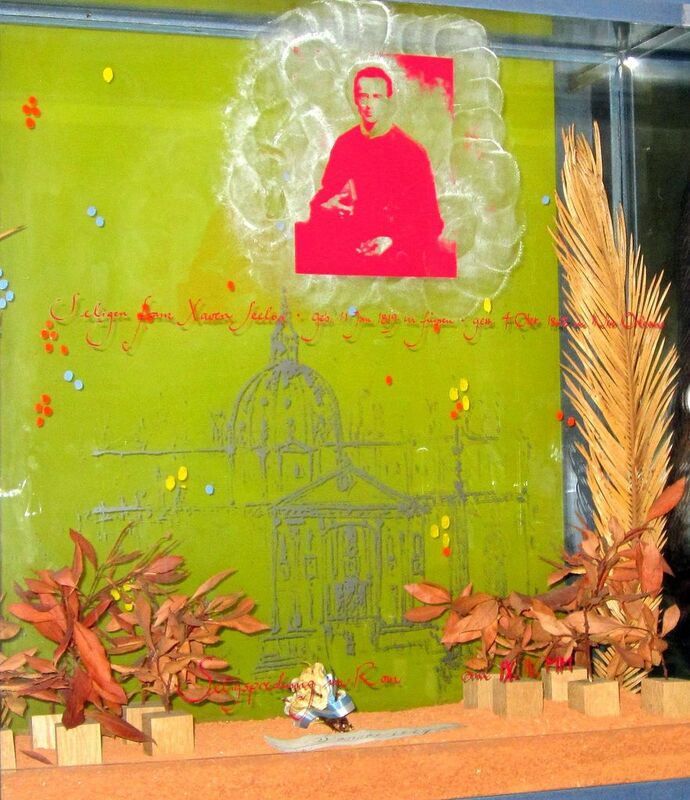 "We have a first class relic of Blessed Francis Xavier Seelos, and we have taken our teenagers on pilgrimage to New Orleans and offered the Holy Sacrifice of the Mass there at his shrine. 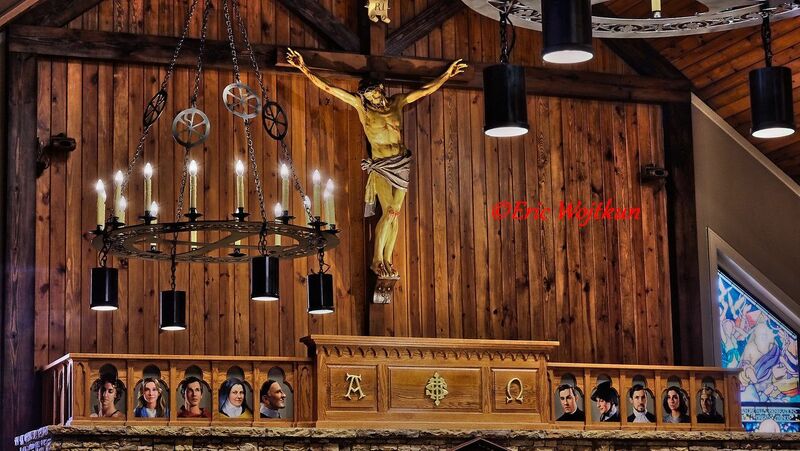 Our reredos is a set of wooden casings that are visible above the stone wall that is behind our altar. 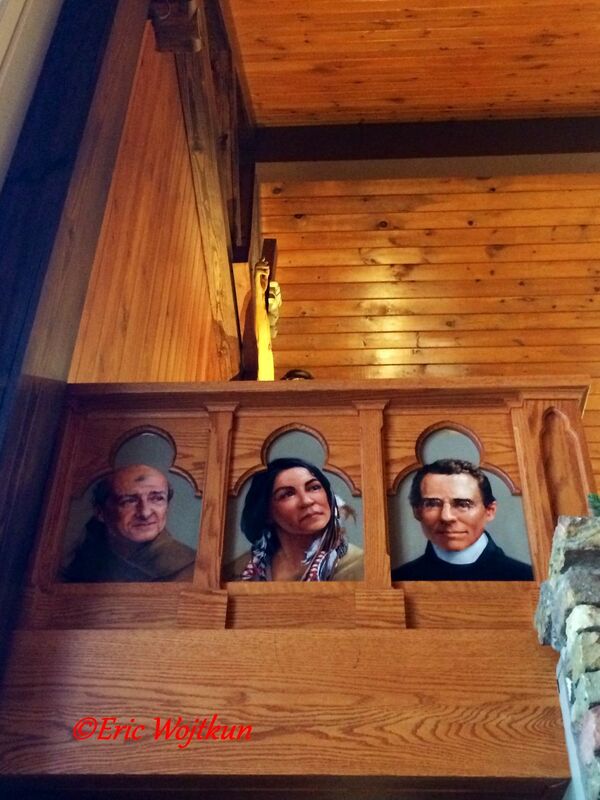 These casings allow space for sixteen hand painted portraits or icons of various saints. From the front, you can see only ten, but then on either side (wrapping around) there are three more to make a total of 16 paintings. These were all painted by Kristina Havens (a local artist).We are very proud of her work." I asked Father Byrd how they came to choose the 16 saints depicted on the reredos,he told us " I picked the saints and blessed, and for different reasons. Americans are made up of many heritages, so I tried to incorporate saints from some of our various homelands. I wanted lay people and clergy, I wanted men and women, and I wanted saints who were not already in our stained glass windows. 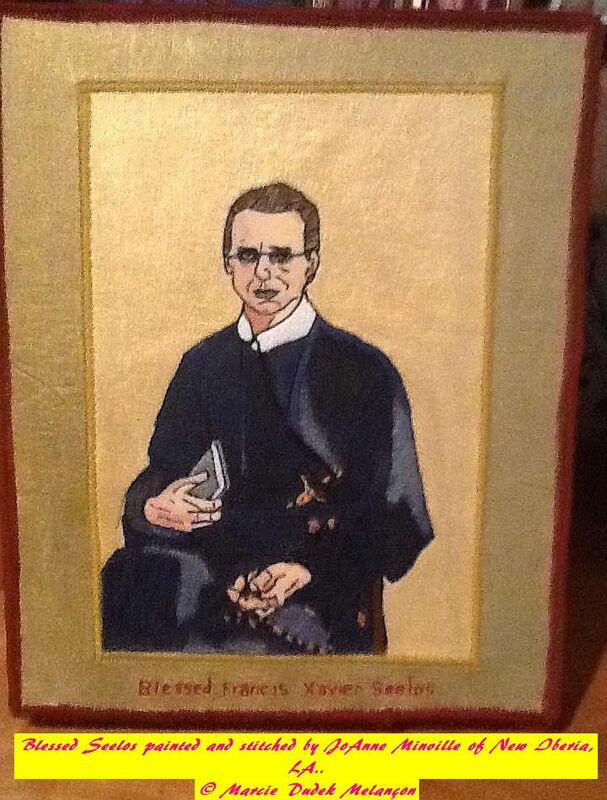 I also chose some saints that were important to our own nation, like Blessed Francis Xavier Seelos. So I have St. Junipero Serra, and St. John Paul II, and St. Monica and St. Joan of Arc, and St. Miguel Pro and St. Kateri Tekakwitha. They are kind of all over the place, but they all look down upon us now, and inspire us. "He did a brilliant job with his choices! 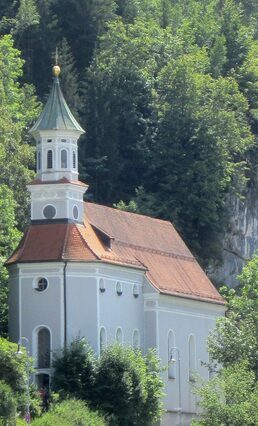 I would recommend that anyone who is in the area makes a visit to this stunning Church which also shares the name of one of Blessed Seelos' favourite Shrines in Germany-The Frau am Bergkirche in Füssen.Blessed Seelos had a great love of Our Blessed Lady.He often asked his sisters to go and pray for him at the Shrine of Our Lady of the Mountain.Letter contained in the book "Sincerely Seelos" The collected letters of Blessed Francis Xavier Seelos edited by Carl Hoegerl,C.Ss.R mention the Shrine on page 69 ref 13 .The Church can be found on the road leading out of Füssen towards the Austrian border,which is 2 kilometres away.It is now only used 2 or 3 times a year,but in the old days,its position on the Via Claudia meant many pilgrims stayed overnight in the two large dormatories located in the roof space of the church.